While I obviously don’t know for a fact that this is how it happens, I consider this to be more of an educated guess than shot in the dark. If we have any designers in our audience, I’d love to hear from you? Is this how the ‘great lie’ of our hobby gets told? I know I’m not alone in this, too. I mean, those times on the side of the box are more hopelessly optimistic than playing a game of Pandemic on the highest difficulty. And that’s not to mention the ridiculous “30 minutes a player” assertion. What kind of crazy maths is that? And while I’m throwing wild aspersions and baseless accusations around, I’m sure it’s the exact same people who decide on the size of board game boxes. Marketing people, I mean. While the motto for play times is clearly ‘less is more’, when it comes box sizes it’s a resounding ‘more is more – like, a lot more’. Why make a box that the components fit snugly into, when you can make a box FOUR TIMES that size and have your game take up four times as much space on the shelf? It’s a no brainer. Who needs trees anyway? Easy as that. If anyone from Asmodee is reading this, I’m available to start immediately and my consultation fees are modest(ish). POST SCRIPT: A friend of ours actually claimed to play Game of Thrones in an hour. We have never played the game with him, so can’t tell for sure. And of course we had to burn him as a witch, so preposterous was his statement. So I guess now we’ll never know. Easiest way to work out the real play time of a game is quoted time divided by minimum players, multiplied by 1.5 and then multiply by the number of players. If you’re playing it for the first time, multiply by 2 instead of 1.5. Add 15 minutes setup, plus another 5 minutes for every square centimetre over a normal size box. Simples. Huh. Why didn’t I think of that? Problem solved forever! You must have powerful maths skills. Are you … some kind of … math wizard? c) begining before 8 p.m. exactly at 1 a.m. I GM’ed the game and did all of the housekeeping for the bad stuff. It mean’t the game kept moving and there was no, Did I do this? We would probably still be there otherwise. The reality is it varies according to so many factors. Experience of players, engagement of players, chattiness of players, and of course, The Wrath of Tue Elder Gods. I’ve designed games that did wind up being 15 minutes per player or whatever. The play time really did scale like that, as I discovered while playtesting at different player counts. Thank you! Glad you enjoyed it, and glad you feel the same way! 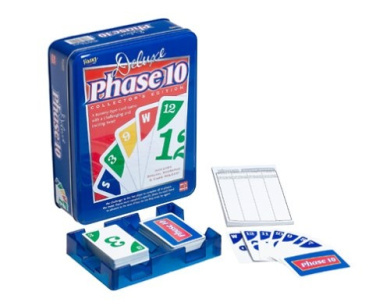 Regarding box size, I once purchased a “Deluxe Edition” of Phase 10. For those not familiar with the Deluxe Edition, it’s a big tin box, probably twice the cubic footage of the Forbidden Island/Desert box, which holds a regular deck of Phase 10 cards, a scorepad, a plastic card holder, and… that’s it. The scorepad doesn’t even pretend to take up the length or breadth of the box. It’s just three small components, a big cardboard insert, and a lot of air, for something that could just as easily be tossed into a Ziploc bag if one were so coarse. So I emptied out that absurdity, and filled it with my components for Star Wars Epic Duels, a game that only takes up half the space in THAT box, but the box had to be sized that way to hold the game boards. But now those game boards are loose, a situation that some might find even more outrageous than storing a card game in a Ziploc bag. I think the worst ‘box size’ offender in our collection is Machi Koro. It could fit in a ‘Citadels’ sized box, but comes in something maybe ten times that size. It’s terrible. It IS nice when you can fit a game and all of its expansions into one box. We don’t have any Machi Koro expansions (yet) but I would be interested to see if when you did put them all in the one box do they fit snugly, or still leave lots of room left over? I have the deluxe edition, which comes with both expansions, so I don’t remember what the inside of the box is like for Machi Koro on its own.The two expansions combined have about 1.5 times the number of cards from the base game, along with some more tokens. The deluxe edition insert has 4 wells and the cards (unsleeved) take up 3 of them. I definitely still have room if they come out with another expansion. Beyond that (or if I wanted to sleeves them) I would have to discard the insert and organize things differently, so it’s definitely not snug, but it’s less absurd. Might be looking to pick up a Machi Koro expansion, actually. Which one would you recommend, or were they all mixed up in the deluxe edition from the start? They all came wrapped separately and I haven’t gotten to the expansions yet! I hate oversized boxes too, but i’ve heard this is more to make game more noticeable on the shelves in the store. Still, annoying.. This comic was nicely timed. We broke out 7 Wonders for the first time yesterday and I think it took us 45 minutes to figure out how we were supposed to play. I’m pretty sure our next run at it will be nice and quick but that 30+minute icon on the side is definitely not correct for the first session. When in doubt, always just yell at everyone to “shut up!” and put on the “how to play” youtube video. It also makes sure everyone has the same level of instruction so they can’t claim later, “you didn’t tell me that” that reading instructions always comes with. I like that last part. As the game was going on, I was looking suspiciously at some of the moves my friend who had the rule book was making. Didn’t help him in the end though! I played GoT once. ONCE. We started at 7PM and it lasted until 2AM. It got down to the last turn and we broke it down for the only person who could influence the outcome. “Attack him, she wins. Attack her, he wins. YOU CANNOT WIN.” But he still insisted on asking for the rule book and taking 20 minutes… That’s why it’s never left the shelf again. Upside though, I won the thematic victory because I was House Baratheon, and I basically cosplayed Robert Baratheon by binge drinking the first half of the game while also always bidding the max to hold the Iron Throne the whole game.